With approximately 95 percent of all new landscape lighting installations being LED, according to Kristoff Byrd, landscape lighting category manager for SiteOne Landscape Supply, LEDs themselves are not necessarily a trend. Though LED landscape lighting installations are the norm in 2018, some contractors emphasize the opportunity they see in halogen to LED conversions. At Southern Lights of N.C. in Summerfield, N.C., for example, Pete Bryant and his team were early LED adopters—the company has been 100 percent LED for more than five years. Today, it does one or two halogen to LED conversions per week. Client conversations have been similar at McKay Landscape Lighting in Omaha, Neb. The company considers itself a late adopter of LED technology. “We’ve been doing LED for about three years, but last year was the first time we specifically marketed conversions,” says Andrew Coleman, outdoor lighting designer and salesperson. McKay has been in business for 27 years, and it has 2,500 customers on annual service contracts to approach for upgrade opportunities. Getting the word out about conversions has been successful. McKay has added three to four jobs per month converting halogen systems over to LED. Most landscape lighting customers quickly understand the benefits of converting from halogen to LED, lighting professionals say. For example, most LEDs have a five-year manufacturer warranty, Coleman says. 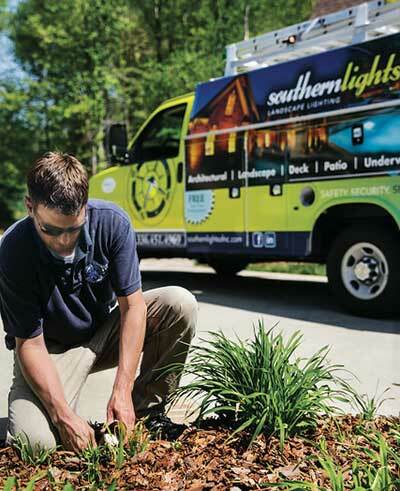 At Southern Lights, a halogen to LED conversion sale is usually triggered by a service call. McKay’s conversion approach has been a marketing campaign directed at annual service customers and also at homes where McKay did the halogen installation years ago but hasn’t maintained an annual contract with the client. It starts with an email, followed by a phone call and then a request for a quote. Now, Coleman says, part of the message is encouraging customers to plan for conversions. At McKay, conversions can be treated like either a service call or an installation job, depending on the scope. The team removes old fixtures and installs new fixtures with a new connector. They often can reuse all the wire, especially if they installed and have been servicing the system. They offer an option to reuse clients’ old transformers or to upgrade to new ones with astronomical timers. When Southern Lights does a conversion, it entails a full system check, taking amperage and voltage readings to ensure the proper load, verifying the system is balanced, that each fixture is receiving equal voltage and that proper wire size was run and checking the quality of the fixtures. This check determines whether the team needs to make further upgrades to the system. Typically, an LED conversion is coupled with a lighting repair or service visit, which falls into a time-and-materials billing structure. Contractors should keep in mind LED conversions may change their business model a bit. Offering LED upgrades is a great way to increase revenue, but moving away from halogen systems limits maintenance opportunities, Bryant says. Service calls become more spread out and require fewer bulb replacements, which generates less service revenue, but that’s not necessarily a detriment to the business, he says. “The more confident people become in lighting systems that don’t need consistent lamp replacements, the better low-voltage outdoor lighting looks over some of the other options,” Bryant says. Coleman says annual service contracts haven’t taken a big hit at McKay. When it comes down to it, Bryant says LED conversions have helped his company grow and given him the ability to offer his clients more value, thanks to LED lighting’s versatility, lower power consumption, warranties and ability to run cooler than halogen systems, which reduces fire hazards.